For the salsa verde mayonnaise, put the first seven ingredients into a pestle and mortar or food processor and grind to a coarse paste. Stir into the mayonnaise, adding more salt if required, and set aside. Break the bread into small pieces. Place in a food processor and process into crumbs – they do not need to be too fine – then turn out on to a large plate. Spoon the flour on to another plate and pour the beaten eggs into a shallow dish. Heat the oil for deep-frying to 190°C/375°F or until a cube of bread browns in 30 seconds. Preheat the oven to 150°C/300°F/Gas Mark 3. Line a large baking sheet with paper towels. Season the megrim sole fillets with a little salt and pepper. Dip the fillets into the flour, then into the beaten egg and then the bread-crumbs, pressing them on well to give an even coating. Deep-fry, two pieces at a time, for 2 minutes or until crisp and golden. Remove to the baking sheet and keep hot in the oven while you cook the rest. Serve at once, with the salsa verde mayonnaise and lemon wedges. Original recipe from Rick Stein’s Fish first published by BBC Books in 1996. 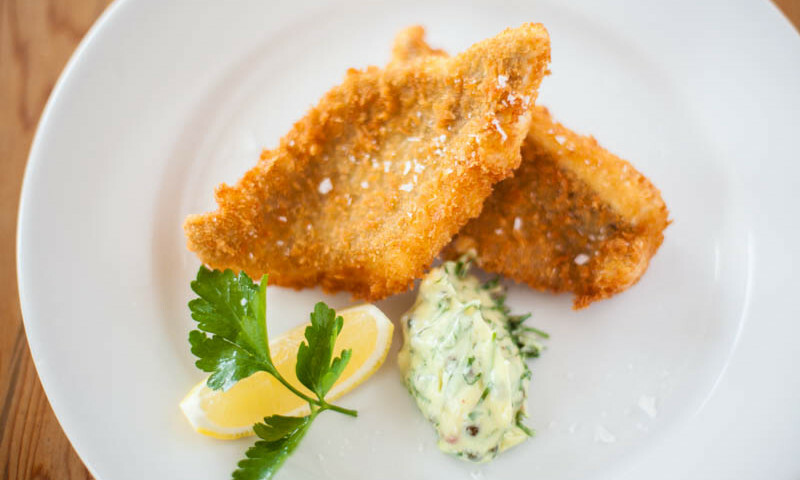 Fillets of Megrim Sole with Salsa Verde Mayonaise – do not publish!